This giant was in Exeter NH and was big enough to fit our whole Crew for a Photo Opp. 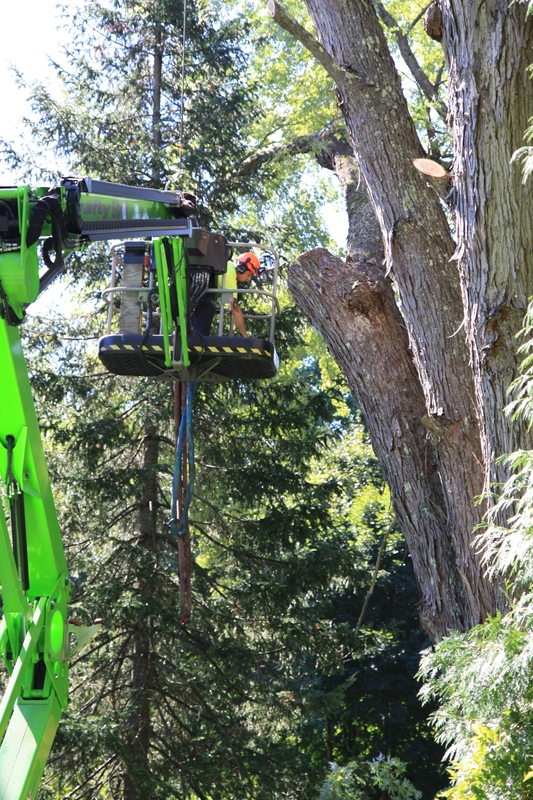 There are few days in our long history of hazardous tree removal that really stand out. I’m not saying it takes a lot to impress us, but… I guess I’m saying we’ve pretty much seen it all. Most of the more memorable, unfortunately, involve Emergency Tree Work, normally centered around Storms, and those are always sad. This week was different. 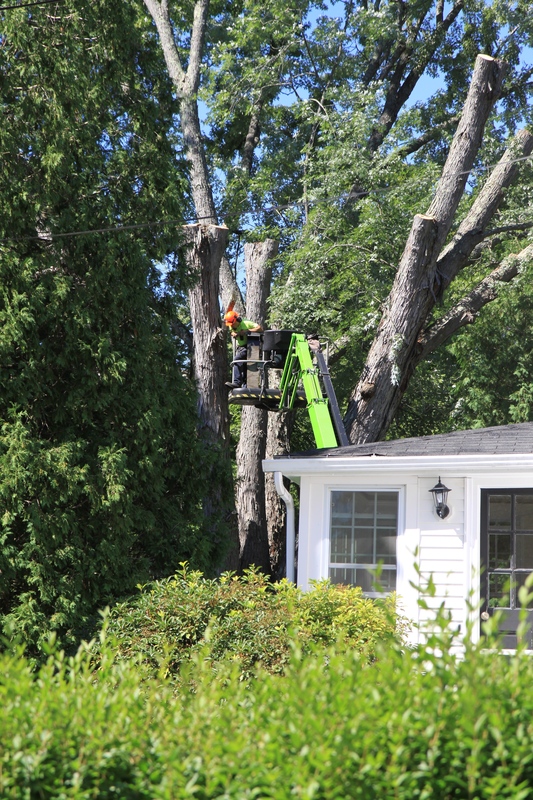 We were faced with a massive Silver Maple in downtown Exeter, surrounded by homes and power lines, more obstacles than on American Ninja Warrior, and it needed to come down. 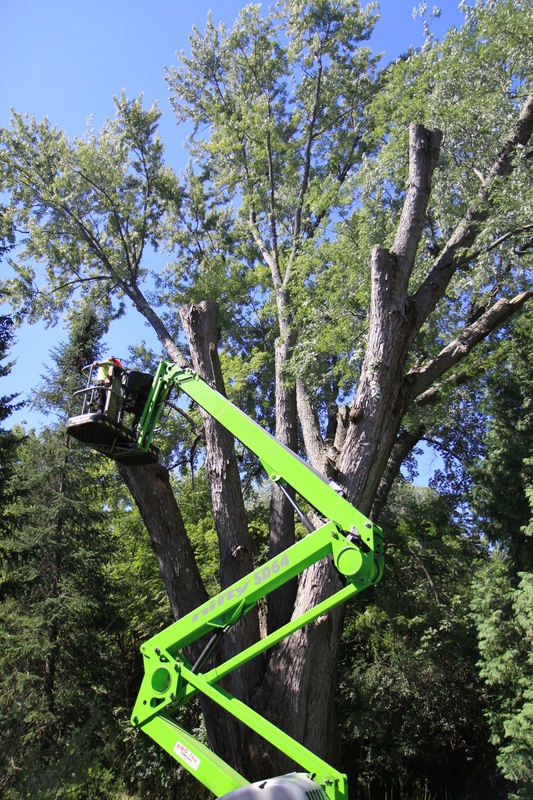 According to the home owners, this tree was rated as one of the largest Silver Maple trees in the state, per the University of New Hampshire’s Cooperative Extension. This massive tree, boasts 8 leaders, and stands over 100+ feet tall. 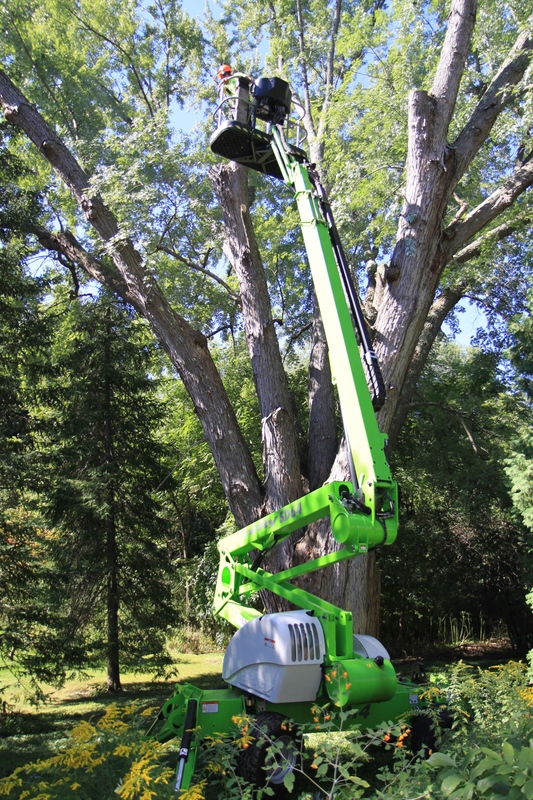 It spans 120+ feet in canopy coverage. The diameter of this tree is over 8′, that’s a 25′ circumference. 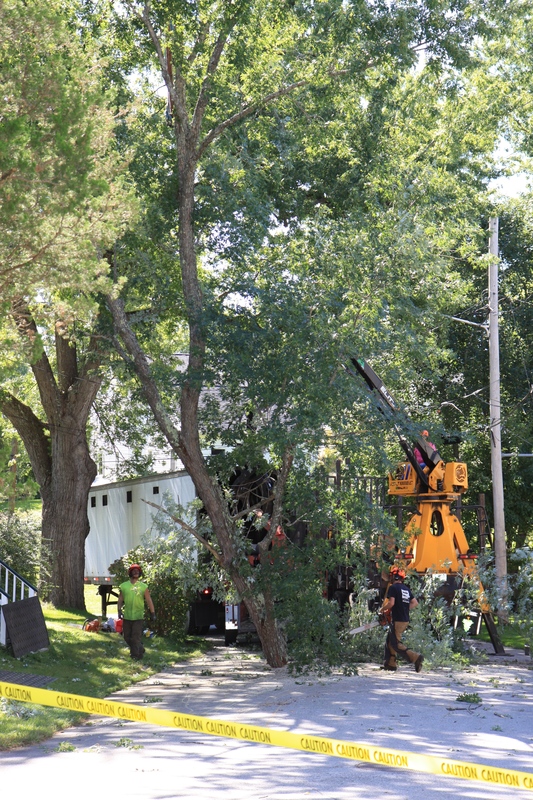 Now to make this even more delicate of a situation, the tree was in the downtown area of Exeter, immersed in power lines and homes. The crew was meticulous, drawing a crowd of on lookers. I’m not quite sure if they were there for the show or questioning what type of crazy person is willing to do this kind of work, but they weren’t disappointed. 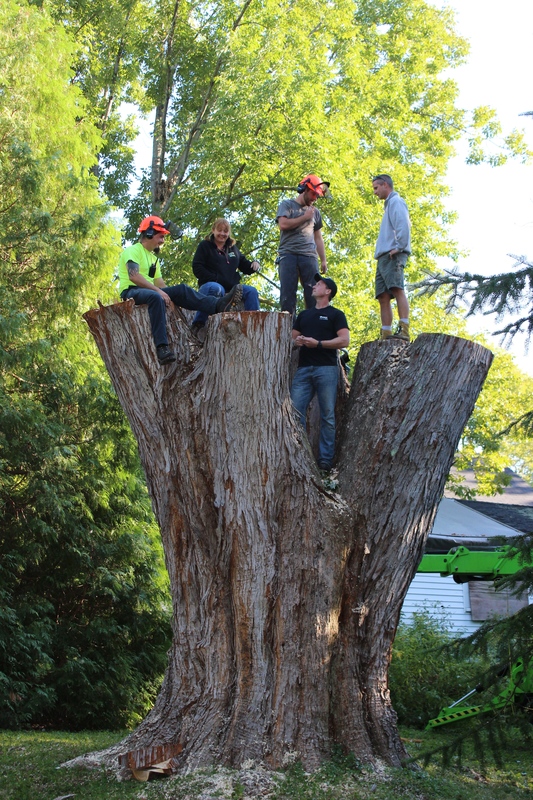 We have been receiving lots of photos from neighbors and passers by, that watched, nervously, as our team carefully dissected this massive beauty of a tree. Once all was said and done, we removed over 50 yards of chips that went to help fuel the Granite State at Unitil’s power plant. Two full log truck loads of firewood, that went to area residents. And a low bed that carried the 22,000+ lb stump. 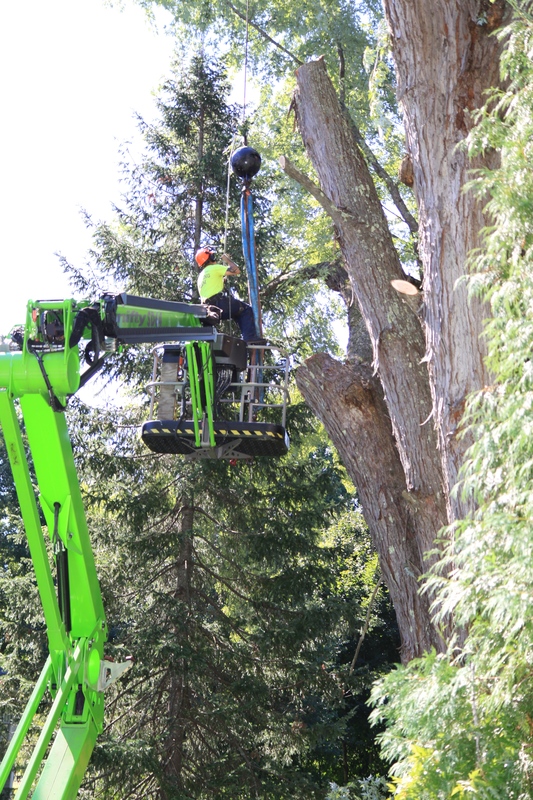 The total tree weighed approximately 115,000 lbs, making it the one of the largest trees that our team has ever removed. 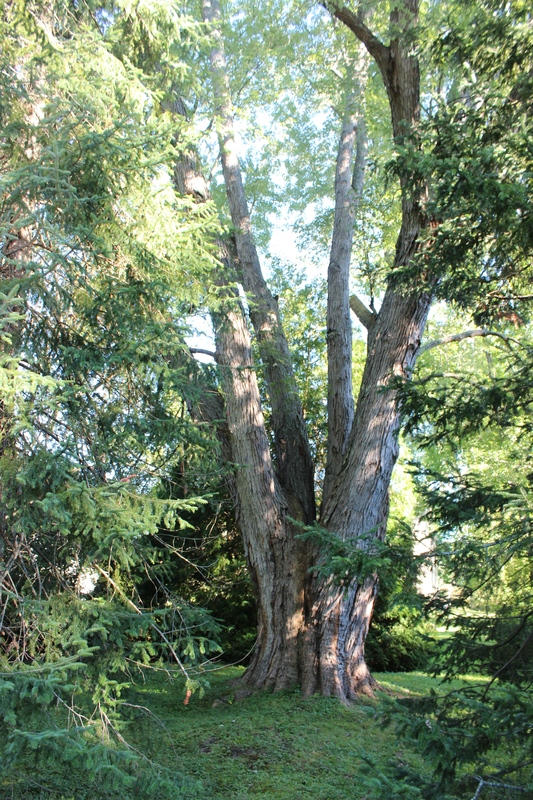 Not one part of this Silver Maple tree went unused and all went to help fuel energy locally, right in the Exeter area. So, the question is, why did we have to remove it? 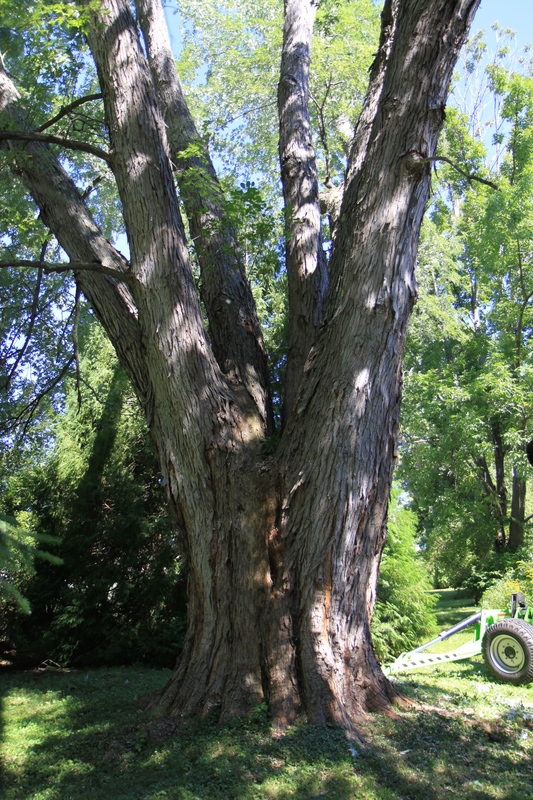 The crotch of this Silver Maple tree was infested with carpenter ants causing half of the leaders that were hanging over the house to rot and threaten the house. The tree was approximately 100 years old. 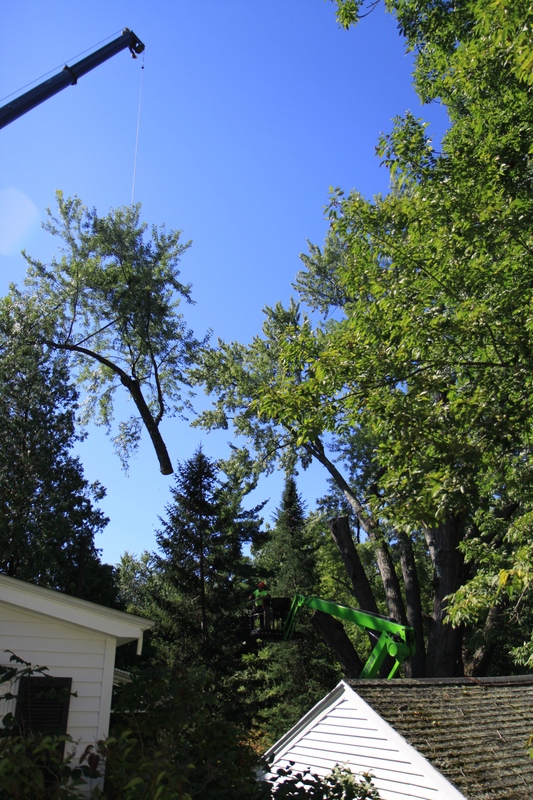 Although it saddens us to see such an old tree meet its end, it is always refreshing to us when the call comes in for tree removal… And not emergency tree removal! All’s well that ends well… Enjoy these great photos from the homeowner and our Team. 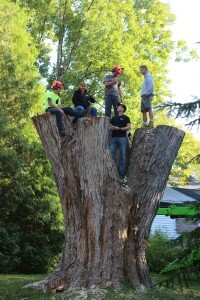 This tree was documented by UNH as one of the largest Silver Maples in the state of NH. We had to shut down the street to set up. 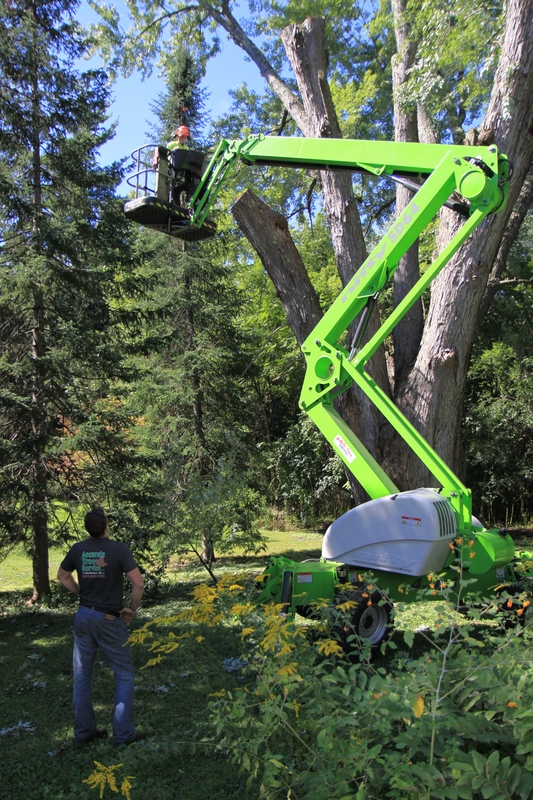 We used our Nifty Lift to access part of the tree due to its delicate tires. This tree was approximately 100 years old and had rot. It was over 8' in diameter! Our climber "flying off the crane ball". 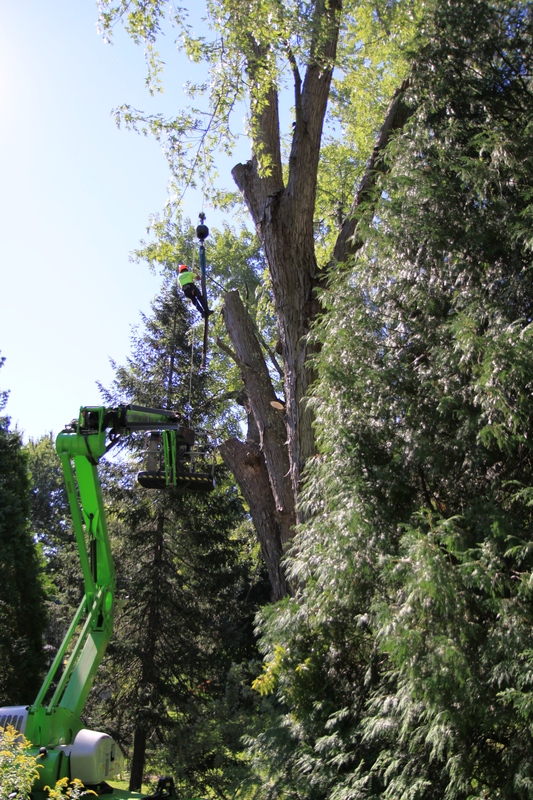 It took a lot of heavy equipment and skilled tree professionals to remove this beast. This tree is gigantic and nestled in between power lines and homes. There was a view from every angle. The crane pieces the limbs over the house. We used a full size chip truck to catch all of the chips and a team of guys on the ground. Our talented log truck driver handling the "pick". Our crew on the ground... And yes, we have a female log truck driver! How cool is that? They have finally made it to the bottom of the tree. Now the heavy lifting. 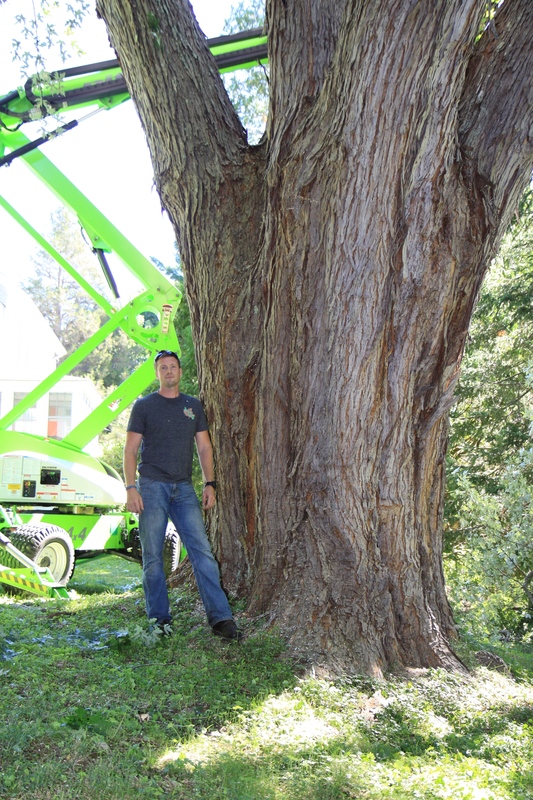 Can't beat a photo opportunity like this when you're in the Tree business. Large enough to fit our crew. The Team piles on for photos. One more photo opp before they remove the trunk. These pieces of truck are so heavy that they needed to transport them on a Low Bed truck. All set to pick up another piece. The crane takes the trunk right over the house. 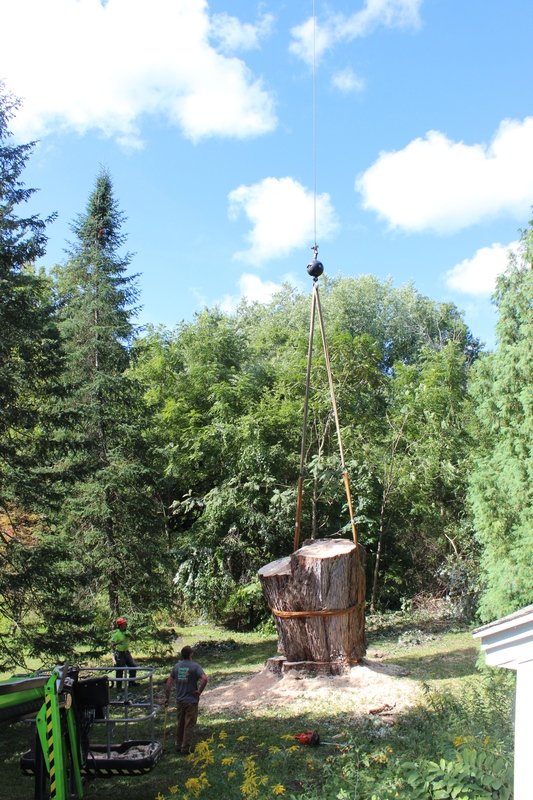 Our Team guides the stump on to the Low Bed truck and prepares it for transport. 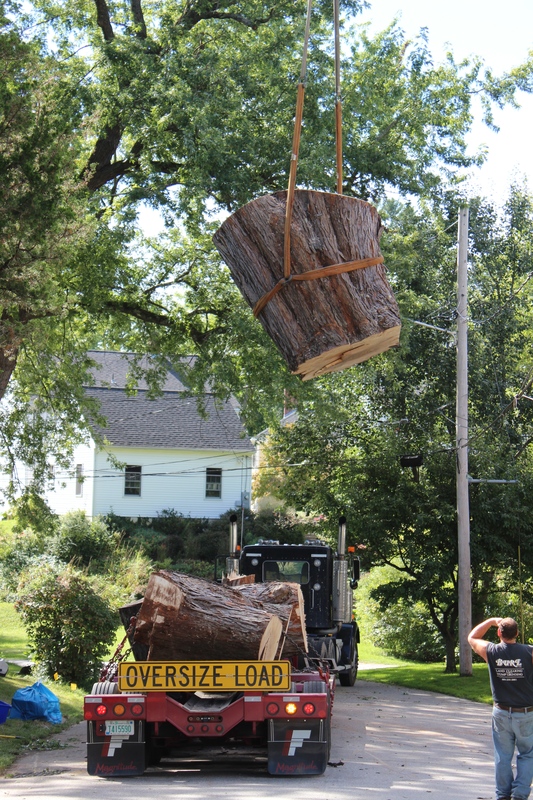 The stump alone weighed in at over 22,000 lbs! Like the tree and stump was never there!